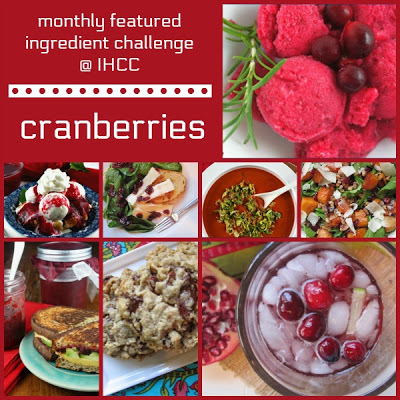 November 12th – 18th: Monthly Featured Ingredient/Dish Challenge- Cranberries! Make a recipe from any of our past or present IHCC chefs featuring cranberries in any way. 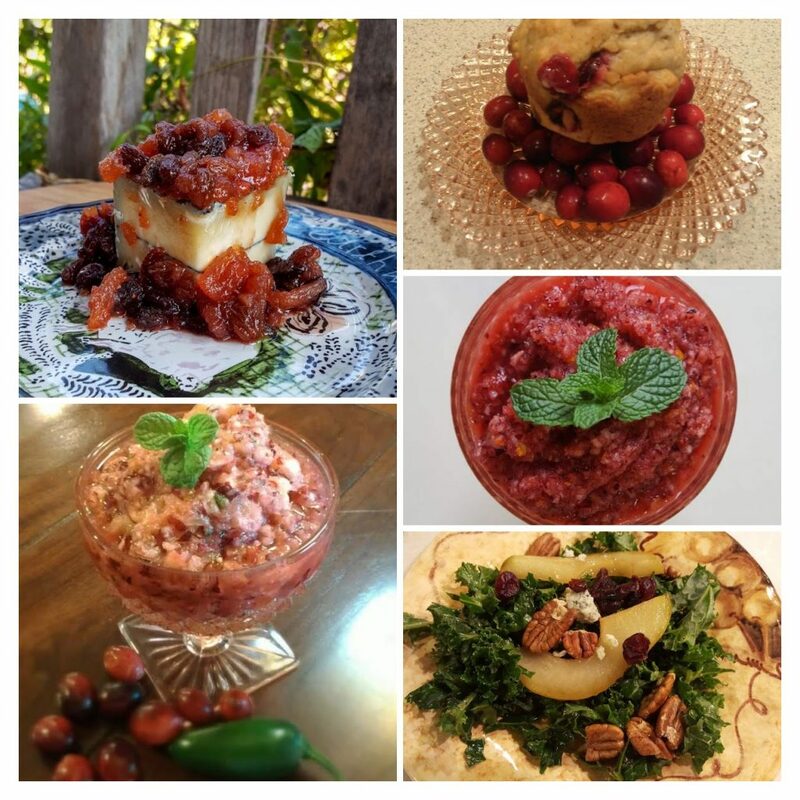 Also, feel free to share any of your past favorite cranberry recipes from IHCC chefs in your post! I honestly didn’t thoroughly read the above announcement when it appeared on the IHCC page. 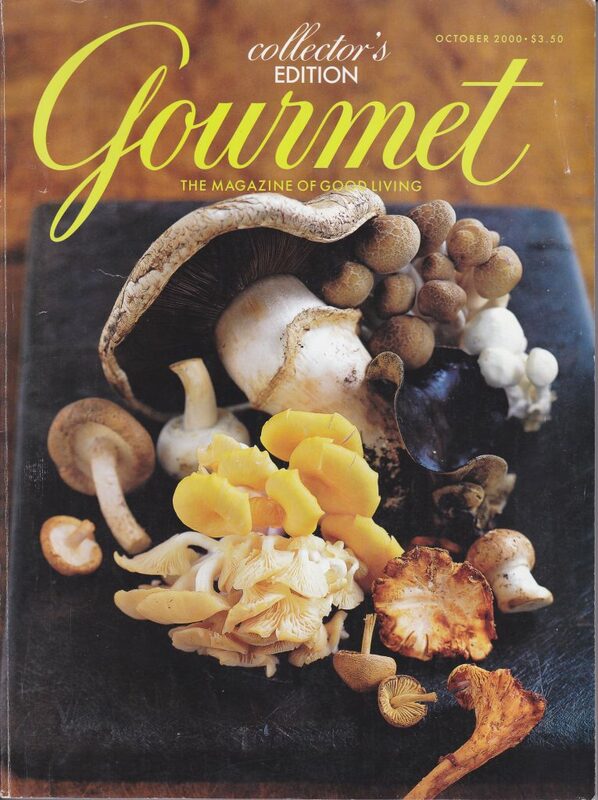 I just immediately jumped into looking through my old Gourmet magazines. I just assumed this cranberry challenge had to be from Ruth Reichl (or her old magazine). Boy, am I glad I stayed with our current IHCC chef. And, I’m glad I found this delicious recipe in an October 2000 Gourmet. Simmer maple syrup and dried fruits in a saucepan, uncovered, until fruits are plumped, about 5 minutes. Remove from heat and stir in juice. Whisk together flour, cornmeal, baking powder and soda, sugar, and salt. Whisk together cream cheese and eggs in a large bowl and gradually whisk in milk until smooth. Add flour mixture and whisk until just combined. Heat a large griddle over moderate heat until hot enough to make drops of water scatter over its surface, then brush with some butter. 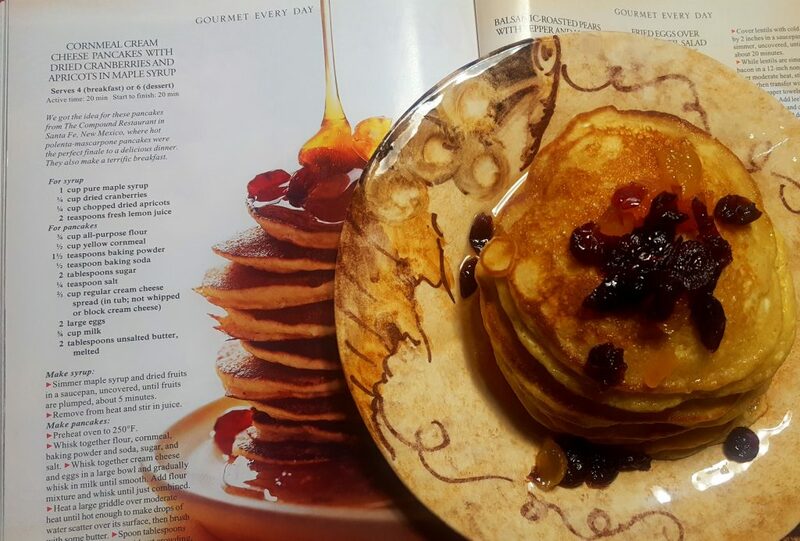 Serve pancakes in stacks with syrup. Prep Time/Cook Time: 20 mins. *I forgot to buy cream cheese in a tub so I just used the block kind. ***I made bigger, regular breakfast-sized pancakes. These are delicious. I will not buy the tub cream cheese to make these in the future. Softened regular cream cheese seemed to work just fine. I will certainly serve these to my upcoming Thanksgiving guests! Isn’t this beautiful and bountiful? Next week’s I Heart Cooking Club theme is bread. November 19th – 25th: Bread Basket! (Pass the Bread Basket because we LOVE bread at IHCC. Make any Ruth Reichl bread recipe and/or make any Ruth Reichl recipe with bread). Whip up some rolls for your Thanksgiving table and share the love with IHCC. Glad I am coming to your house for Thanksgiving!! These pancakes sound divine. We love pancakes in our house so I will have to try these. I am going to look into your cranberry muffin recipe too. I made a Gourmet one but I was not happy with it. Happy Thanksgiving. You must try these!!!! Let me know about the muffins! I love that you tapped into a Gourmet magazine! I have been wanting to buy some of the magazines from ebay just to have some in my collection. No way can we call 2000 retro or vintage. It was just the other day, right? I love these pancakes! I’ve never experimented with adding cream cheese to the batter but that sounds incredible. This is a must make! I wish I would have saved more! I love looking through old magazines for recipes. What could be bad about these pancakes! 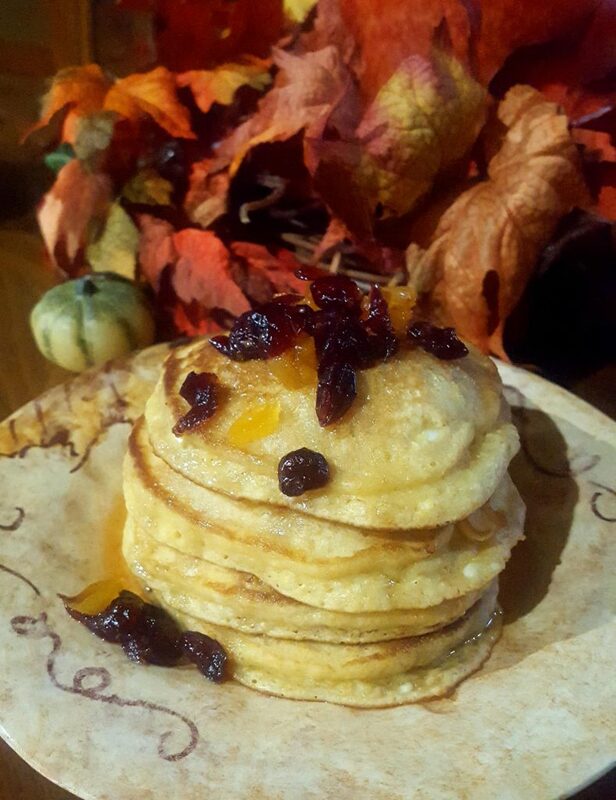 yum..
Looks absolutely delicious and that fruity maple syrup sounds just as amazing. I think I would add some orange zest the next time I make the syrup. Now I know what to do with the bag of cranberries I just bought. This is such a seasonal and festive dish I have to make during the Thanksgiving break. Thanks for the recipe. Thanksgiving or Christmas or Valentine’s Day or Easter…. 🙂 Enjoy! These were great when you treated your relatives to this for breakfast. Oh how I love cornmeal pancakes and these with the cream cheese spread sounds extra special. Just happen to have some of that spread in the fridge waiting for a purpose. Thanks for sharing these great pancakes!